Every year, a large number of Baloch students in almost every University across the country where they have a presence wait for 2nd March to mark Baloch Culture day. 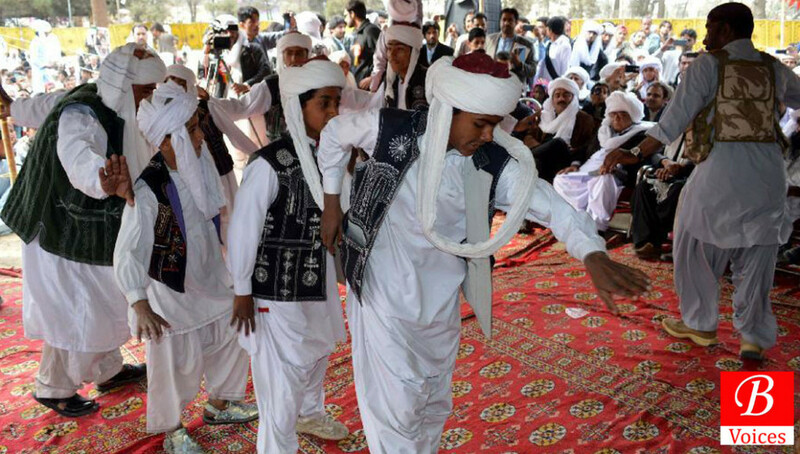 They begin preparing long before for traditional dresses, turbans and shoes to wear on this day to celebrate traditions, dances, values, and norms of Baloch people. Usually, Baloch take a lot of pride in their values and traditions, meaning culture carries a lot of weight in their daily affairs. When a large population conducts life around certain norms or values, it becomes important for obvious reasons. If culture plays such an immense role, definitely, it needs our serious consideration for adaptation of new values with changing times, flexibility in previous practices and the addition of new ingredients. Since these elements are missing from Baloch culture; people are stagnant in time and conduct their lives around previously established practices. Turbat is a thriving city of Balochistan with relatively better human development indicators, have a chunk of youth educated from the good public and private universities of Pakistan such as Quaid-e-Azam University, Islamabad, Punjab University Lahore etc. Yet, the atmosphere of Turbat echoes rigid cultural settings, where the presence of women in Turbat Bazaars is non-existent. Women don’t take part in daily transactions in any main marketplace. Although, there are two or three multi-shop stores like StarPus and Ladies Market dedicated to women only. This exclusion of women from bigger market picture somehow comes from the cultural belief that Baloch have immense respect for women, it’s better for them to sit at homes and conduct their market transactions through men. Certainly, it isn’t different in many other cities or towns of Balochistan except Quetta. I think the time has come to relinquish such beliefs, which exclude women from public life, on this coming culture day. Traditional dresses of women also enjoy a central space in Balochi culture, nobody ever estimated the opportunity cost it entails. Most of the educated women are government or private teachers in schools, higher secondary colleges in Turbat. These women make significant earnings each month. A higher percentage of earnings of these women go to making expensive Balochi dresses, not only this, they are also engaged in embroidering after their working hours. This time could have been used for other constructive activities like reading, watching a good movie etc. but it is invested in a basic need i.e. clothing. All life earnings are being spent on one basic need of clothing only, from which one can make lifetime assets. Women, who don’t earn themselves, don’t shy away from pouring in money of their spouses into this clothing mania. Moreover, discussions revolve around new embroidery patterns everywhere be it schools, colleges or houses. Women have to realize that they have bigger roles to play, their time and earnings are valuable, should be allocated to activities wisely. We can have a burgeoning Balochi culture without these hefty women dresses. I have drawn on two, very small examples but there is too much in our culture that needs attention and re-thinking. It begins with the behavior of men until tremendous differences in physical attires of married and unmarried women, because of cultural definitions. I am writing this in hope that on this March 2nd, Baloch will not only celebrate their culture but engage in a discussion for revisiting it too. Baloch people need a culture that embodies freedom, flexibility, and diversity and change not rigidity and stagnation. On this upcoming culture day, we should also promise ourselves that we not only advance our cultural values but also excel in fields of science, technology, and education. Because we need more companions to make our mark in the world and for long culture was our only acquaintance. It’s time to redefine this acquaintance too. The writer is a postgraduate student of economics at Lahore University of Management Sciences and hails from Turbat, Balochistan.